Korean beauty brand Etude House has released a limited edition Summer 2016 collection based on the Japanese manga Wedding Peach . The collection consists of several makeup items, including 7 Play Nail colors. Unfortunately, the polishes don’t seem to have any names: just numbers. 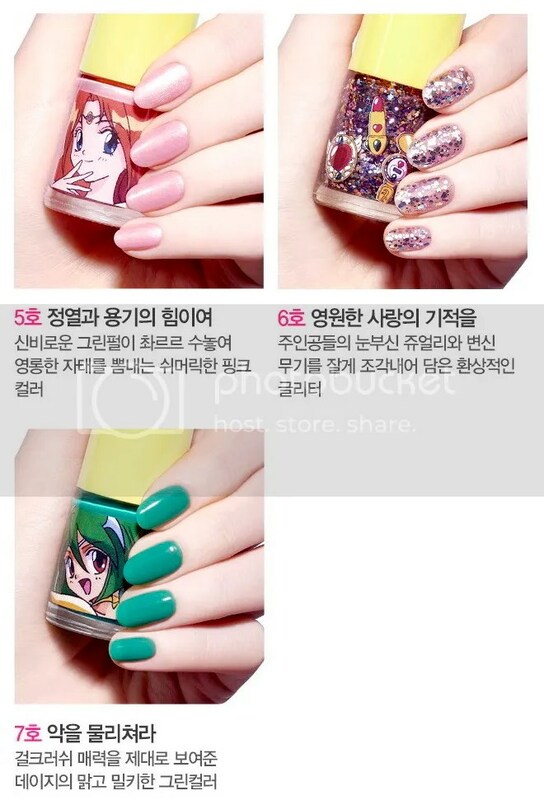 The 8 mL polishes are USD$4.98 at Jolse. I can be a real sucker for LE packaging! Haha! Ooh how cute! I like that lavendar one. I’ve wanted to order off Jolse for ages… hmm need to browse around. I ended up browsing their site after getting some masks from them via Amazon.ca. Hush… I’m back on a makeup no-buy from now until October. I can just pretend to online shop… sigh. Ooh, another no-buy! Good luck 🙂 I guess after the Japan trip, you’ve done a lot of hauling! I’ve hauled a bit myself, too, what with the US-based family coming up to visit, heheheh.